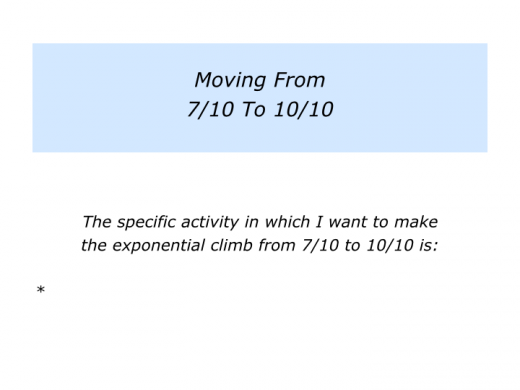 Many people can find activities in which they can quickly reach 7/10. 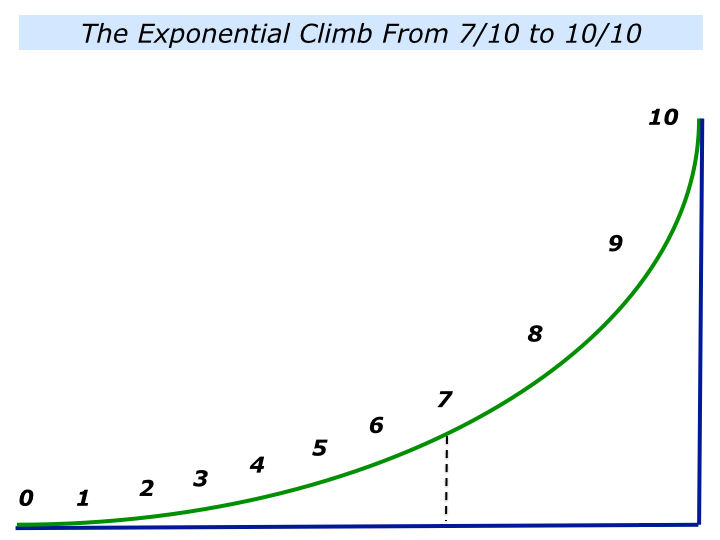 But then comes the hard part, which is the exponential climb to 10/10. This is the equivalent of graduating from county champion to national champion to continental champion to world champion. This is an enormous climb and much greater than from 0 to 7/10. The only difference being that it is not a competition against others. It is aiming to become the best kind of person or professional you can be. Let’s explore how you might want to follow this route in your own way. 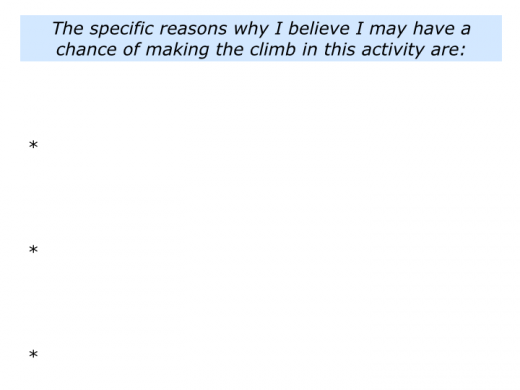 How to choose an activity where you have the chance of making such a climb? One approach is to start by asking the normal questions that highlight your strengths. 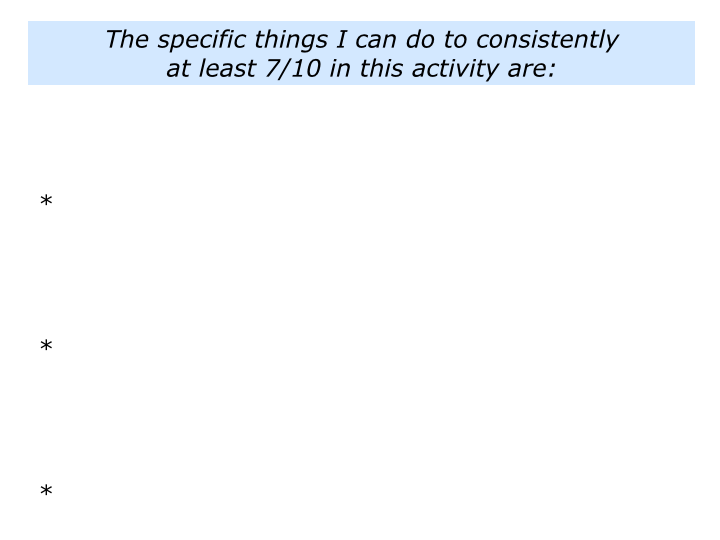 What are the activities in which I deliver As, rather than Bs or Cs? What those where I have natural self-discipline? What are those where I score highly on drive, detail and delivery? What are those where I see the destination quickly – where I go ‘A, B then leap to Z’? What are the activities where I have a strong track record of finishing? It can be useful to choose an activity that gives you positive energy and where you have ability to deliver peak performance. Sometimes this calls for making tough decisions. It means saying ‘Yes,’ to one thing and ‘No,’ to several others. An all-round athlete, for example, chose to go for gold in the Olympic Decathlon, rather than bronze in the 400 meters. A visionary leader chose to build and sell start-up companies, rather than become the GM of an established company. 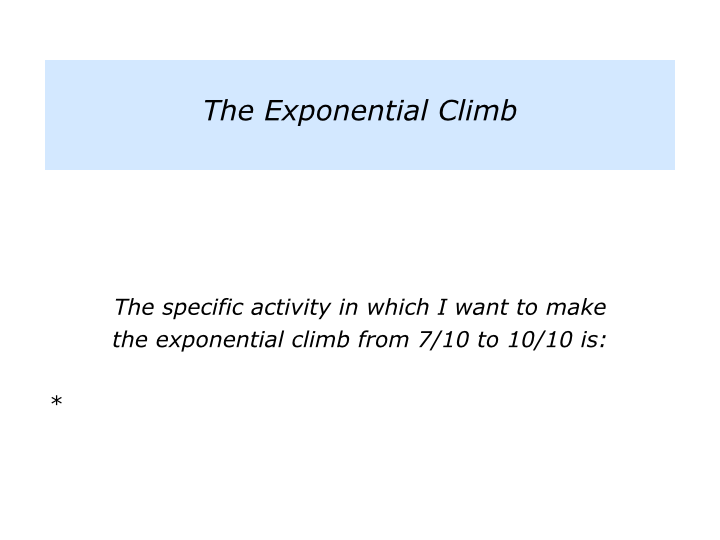 Describe the specific activity in which you want to make the exponential climb from 7/10 to 10/10. Describe the reasons why you believe you have a chance of making this happen. 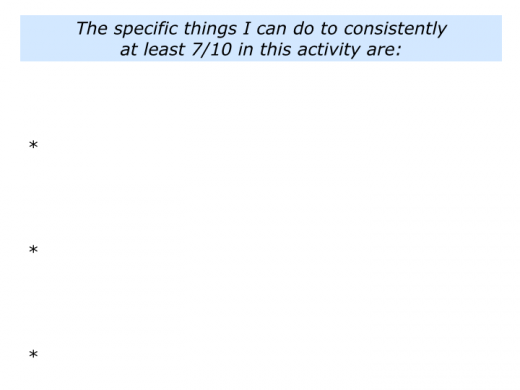 Describe the benefits of focusing on this activity – both for yourself and other people. 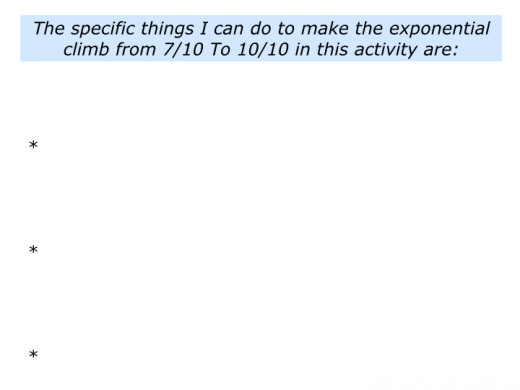 Imagine you are going for your annual performance review. 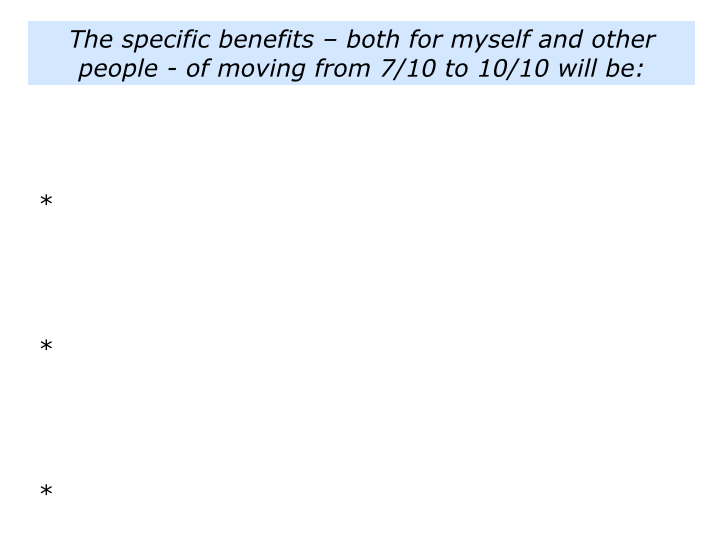 In some organisations getting 7/10 is a minimum requirement. How can you consistently deliver this professional standard? 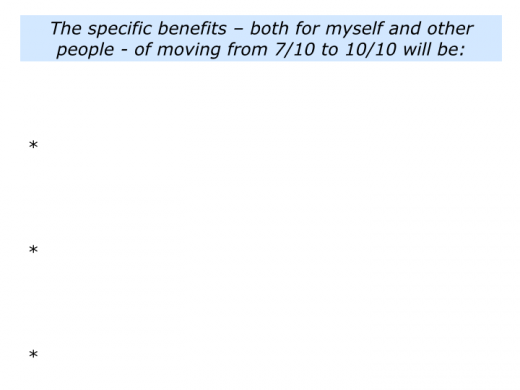 In some aspects of your work, of course, you must also score near 10/10. A surgeon must do this when performing operations. It may be other aspects of the work that bring down the overall score. Great sports teams, for example, are made up of people who consistently deliver at least 7/10. These soul players provide the platform for success. Such teams also have some people who are both soul players and star players. These people do the necessary teamwork and sometimes produce a touch of magic. This raises the whole team’s performance and helps them to win trophies. Let’s return to the activity in which you want to deliver the goods. 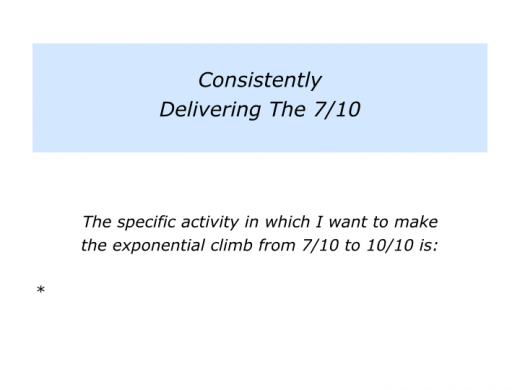 How can you consistently deliver at least 7/10? Passion provides the starting point, but persistence is required to reach your goals. It calls for doing the right things in the right way every day. Bearing in mind your chosen activity, how can you maintain good habits? If you wish, try tackling the exercise on this theme. 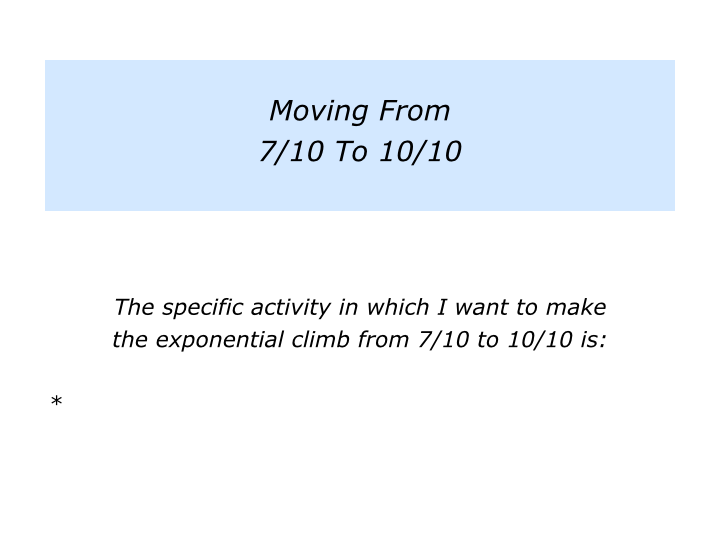 Describe the specific things you can do to consistently deliver at least 7/10 in this activity. 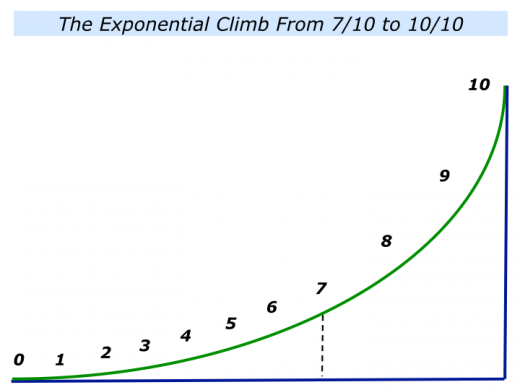 How can you make this exponential climb? Let’s explore some ways to make this happen. Great leaders are not well rounded. But they build leadership teams that are well rounded. Successful freelancers take a particular route to delivering success. They play to their strengths and focus on where they deliver As. Doing what they do best provides the money to hire other people – such as accountants – who can manage the consequences of their Bs and Cs. This is the path taken by creative people throughout history. They build on their strengths and aim to create their own niche, rather than compete with others. How to get paid for doing what you do best? One approach is to do the following things. Clarify your perfect customers – the kinds of people with whom you work best – and the challenges they face. Clarify how you can use your strengths to help them to achieve success. Clarify how you can do work for these customers and help them to achieve success. Sometimes this may mean doing work for free, but every success story can be added to your portfolio. This enables other people to see what you deliver. After all, people buy success, not the theory of success. Taking this route can enable you to create your own niche and target audience. You can then make the rules for ‘the new game’ and deliver great work. Clarifying this style can enable people to do their best work. Here is one way to explore your positive history. Describe three satisfying projects you have done in your life. The word ‘project’ can be used in its widest sense. For example: writing an article, organising a fun run, launching a web site, solving a particular problem, leading a team or whatever. Describe your successful style of working. Looking at each project in turn, what made them satisfying? What did you do right – what were the principles you followed – to do fine work? Can you see any recurring patterns? Bearing these things in mind, describe what you believe may be your successful style of working. Describe the things you can do to follow your successful style in the future. Looking ahead, how can you follow these principles – plus maybe add other skills – to do fine work in the future? There are many models for achieve peak performance. Some apply to individuals, other models apply to teams, some can be used by both individuals and teams. One of the latter can be found in the work of Bill Walsh. He was a legendary coach for an American Football Team, the San Francisco 49ers. Bill believed it was vital for everybody in an organisation to deliver certain Standards of Performance. This was more important than striving for ‘winning’. 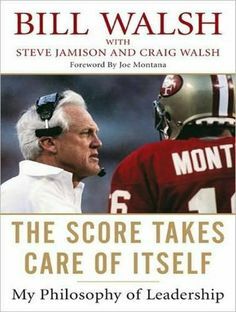 He believed that, providing people consistently delivered the Standards of Performance, ‘the score took care of itself’. Did it work? Despite not focusing on ‘winning’, his team was hailed as a dynasty. It took two seasons – 1979 and 1980 – to turn around the ailing team. The 49ers then won the Super Bowl three times – in 1981, 1984 and 1988 – before Bill retired. Let’s explore some of his ideas. “While I prized preparation, planning, precision, and poise, I also knew that organizational ethics were crucial to ultimate ongoing success. This called for commitment to details, such as people having a positive attitude, no shirttails out when wearing the 49ers uniform, being prompt, showing good sportsmanship – no strutting, posturing or cheap shots, controlling of profanity, treating fans with respect and exhibiting a professional demeanour. There may be 20% they couldn’t control, such as a referee’s call, a bad bounce or fortune. The team aimed to prepare and perform properly, however, because this vastly increased the chances of success. “Maintenance workers, ticket takers, parking lot attendants, and anyone receiving a pay check with the emblem of the San Francisco 49ers on it were instructed as to the requirements of their own job’s Standard of Performance and expected to measure up. He believed in educating people to consistently deliver the basics. They could then add the brilliance. You will, of course, do this in your own way. Let’s return to the activity in which you want to do your best. If you wish, try tackling the exercise on this theme. This invites you to do the following things. Describe the specific things you can do to make the exponential climb from 7/10 to 10/10..